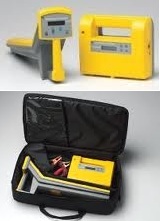 Fuji PL-1500 Pipe and Cable locator has been developed to get right to the point at the most cost effective way. The PL-1500 offers two options with a high frequency (82.525kHz) and a low frequency (8.125kHz) locating units. Both the PL-1500 units are equipped with depth measurement capabilities and passive frequencies (50Hz/60Hz) for cable location. The high frequency locator has shown to occasionally jump non-conductive insulators and gaskets, and the low frequency locator is well suited for long distance tracing. The PL-1500 is powerful, versatile and extremely user friendly. 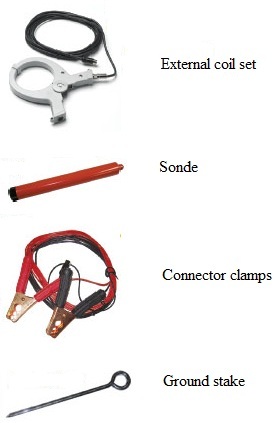 Capable of tracing and locating any continuous metal such as iron, steel, copper water lines, gas lines, tracer wire by plastic pipe, telephone/TV cables, copper and aluminum wire, conduit and power lines. Max operating depth is 5 metres. The transmitter runs on 8D cell batteries and the receiver on 6 AA batteries. Package includes a padded case, transmitter, receiver, manual, ground stake and conductive clips. The external coil set and sonde is an optional extra.